Mosaic at Largo Station is defining luxury apartment living in Largo. Residents love the style of the community and the location near Lake Arbor, MD. Choose from their spacious one and two bedroom floor plans designed with you in mind. Each of their one and two bedroom floor plans feature first-class amenities that will complement any lifestyle. 9-foot ceilings and wood-style flooring give each apartment a luxurious appeal. 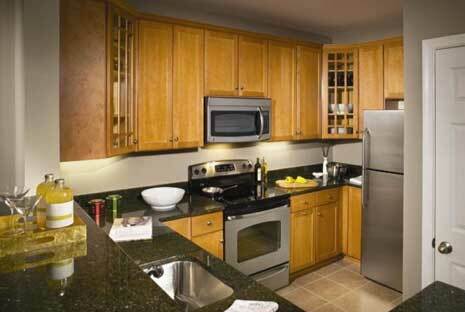 The kitchens are designed with islands, stainless steel appliances, beautiful Maple cabinets, and granite counters. Each apartment also includes a private balcony.Residents of Mosaic at Largo Station enjoy a basketball court, a grilling area, fitness center, and a refreshing swimming pool. If you prefer to stay inside, they also have a billiard room, business center, and a clubhouse with a media theater room! Combine that with the convenience of valet dry cleaning service and their package service.